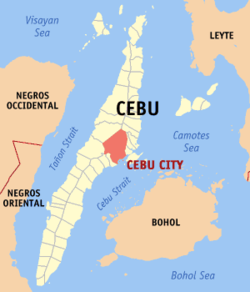 The Ceety o Cebu (Cebuano: Dakbayan sa Sugbo, Filipino: Lungsod ng Cebu, Spaingie: Ciudad de Cebú) is the caipital ceety o the province o Cebu an is the "seicont ceety" o the Philippines, bein the centre o Metro Cebu, the seicont maist populous Metropolitan aurie in the Philippines efter Metro Manila. Wi a population o 866,171 as per the 2010 census, it is the fift maist populated ceety in the kintra. Cebu Ceety is a signeeficant centre o commerce, tred an eddication in the Visayas aurie. The ceety is locatit on the eastren shore o Cebu island. It is the first Spainyie dounset an the auldest ceety in the Philippines. It is the centre o a metropolitan aurie cried Metro Cebu, which includes the ceeties o Carcar, Danao, Lapu-lapu, Mandaue, Naga, Talisay an the municipalities o Compostela, Consolacion, Cordova, Liloan, Minglanilla an San Fernando . Metro Cebu haes a tot population o aboot 2.55 million fowk (2010 Census). Cebu Ceety is bordered tae the northeast bi Mandaue Ceety an the toun o Consolacion, tae the wast are Toledo Ceety, an the touns o Balamban an Asturias, tae the sooth are Talisay Ceety an the toun o Minglanilla. Athort Mactan Strait tae the east is Mactan Island. ↑ "Province: CEBU". PSGC Interactive. Makati City, Philippines: National Statistical Coordination Board. Retrieved 15 November 2012. ↑ 2.0 2.1 "Population and Annual Growth Rates by Province, City, and Municipality; Region VII - Central Visayas: 1990, 2000, and 2010" (PDF). 2010 Census of Population and Housing. National Statistics Office. Retrieved 2012-11-16. This page wis last eeditit on 9 Juin 2018, at 17:12.